If there’s been one artist thus far on our romp through rock history that we’ve been most consistently effusive about it’s undoubtedly Amos Milburn. Our appreciation of his talents – vocally, instrumentally and as a songwriter – haven’t wavered, whether during his initial struggle for commercial returns during the October 1947-September 1948 period or during his subsequent breakthrough in the months since, when two consecutive releases topped the Race Charts as well as each earning a ★ 10 ★ in our scoring, giving Milburn two of just five in total that we’ve handed out to date on Spontaneous Lunacy. But if one thing has become clear on these pages after nearly a year of reviews covering twenty months of rock ‘n’ roll it’s hopefully that nobody is immune from criticism when it’s deserving. There’s no hidden agendas, no favoritism being played here. Each artist… each record… is judged strictly for what it brings to the table at the time. 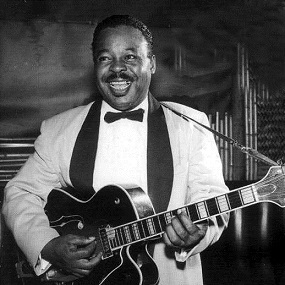 Even the some of the most highly praised artists we’ve encountered – Roy Brown, Andrew Tibbs – have taken their lumps along the way, while others whose names are storied in rock’s history such as Wynonie Harris and Big Joe Turner have been repeatedly called out when they were wandering about aimlessly on the road to eventual superstardom. All of which is just a way to ease you into the fact that, for the first time in eleven reviews, Amos Milburn is due for some wholly deserved criticism. Well, maybe not Milburn himself, not exclusively anyway, as the onus for this relative misstep has to fall on Aladdin Records for slotting this as the follow up to two immortal sides. Anyway you look at it Jitterbug Parade is a decided step down from what immediately preceded it in Milburn’s catalog and the reason is that instead of taking a step FORWARD and building off either of his last two sides, one uptempo, the other a ballad, they merely go backwards and attempt to replicate as closely as possible the first of those smashes and pass it off as something new. 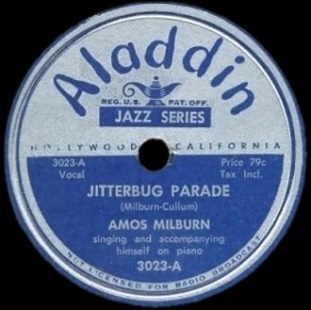 Milburn had a hefty backlog of unissued material when the recording ban hit as 1948 kicked off and so Aladdin had plenty to choose from as the months rolled on. While their initial releases failed to connect it wasn’t due to lack of quality, nor even misreading the market, you could honestly chalk up his failure to score a hit throughout the first nine months of 1948 as a quirk or a fluke, since most of it was the equal or better of those records that were making the charts. When they finally did break through in the fall it was with a song they’d cut a full year earlier called Chicken Shack Boogie, showing just how far ahead of the game he’d been conceptually all along. The record was a call to arms that perfectly encapsulated everything that rock had been up to that point while also looking forward to all it would be over the next few years. But a funny thing happen on the way to the top of the charts… it seemed to have convinced them perhaps that their previous releases were somehow flawed, even though they came out of the same sessions that got them to the chicken shack in the first place! This was compounded when in their only session of 1948 during the ban, a clandestine stop over in Chicago to cover a recently released song that was making noise, the resulting record – Bewildered – turned into Milburn’s second #1 hit. Now to be fair once these songs hit the charts the recording ban had been lifted and so they, like every other label, were anxious to get their top stars back in the studio to lay down new sides that could take into account the new sounds that had emerged over the previous year. So even though Milburn still had some excellent material left in the vaults – Wolf On The River in particular being a scorching side that deserved to be heard at the time – it made perfect sense to have him cut newly conceived material. So they convened in February and cut a five song session (one more tune than was standard). Unfortunately they – and Milburn gets some blame for this for going along with this idea, even co-writing the track in question – chose the song that was the most blatant rip-off they could conjure up for Chicken Shack Boogie, thereby diluting the impact of the original which was best left to stand on its own, while at the same time giving indication that they somehow viewed Milburn’s success as circumstantial rather than the result of his prodigious skills. As any reader of this blog knows I have little regard for sequels, remakes and warmed over retreads. It’s not a universal panning though – other than maybe in the creative realm – as there are some, like Roy Brown, who’ve taken their earliest models and updated them with more appropriate arrangements and come away with a winner. But that’s not the case here at all, as Jitterbug Parade is a straight down the line rehashing of what was already done and was still so recent (at least when it came to what the audience had heard) as to make its arrival, which by this point with two straight mega-hits had fans clamoring for his next release, thoroughly anti-climatic. You feel like you’ve been ripped off. But that’s not to say that aurally the record isn’t exciting. Chicken Shack Boogie Part Two it may be, but the prototype was so addicting that hearing it again isn’t going to change your impressions of its strong points. If anything they’ve actually bolstered the arrangement slightly on this take as Maxwell Davis lets the sweat fly from his saxophone even more than on the “original” Chicken Shack. The horns that kick it off actually sound a little outdated for a few seconds before muscling up. From then on Davis takes center stage and delivers a scintillating workout on the horn. It’s obvious in his year away from the recording studio (more or less) has been spent listening closely to what is selling because he raises the bar on his previous efforts in this regard, letting loose in a way we’re not altogether accustomed to hearing from him. He’s aiming squarely at the rock crowd’s most nagging itch and giving them the means with which to have it scratched. Also making a welcome appearance is Gene Phillips on guitar. It’s been awhile since we’ve seen Phillips around here as his own early foray into the outskirts of rock on Big Legs at the dawn of its lifespan was a bit compromised by his lengthy background as a Louis Jordan disciple. That trait proved to be something he was unable to shake completely free of vocally and as a result his time spent as a rock artist was momentary at best. But as a sideman he’s under no such philosophical constraints and so here he allows himself to be subservient to the intentions of a pure-bread rocker like Milburn and cuts loose in support with some brief but stinging lines on his axe. But as well as it’s played all around (though it’s a pity that Milburn’s piano is de-emphasized to a degree, taking no leads) the end result is still a let-down. Not the music, but the structure. This is nothing more than a new paint job on an old car… a car that still runs fine, still looks sharp and still has plenty of miles to go before it’s ready for the junkyard so there was no need to haul it into the body shop. What rolled out of that shop may be just as good looking at a glance, I’ll even go so far as to say the mechanics may have installed an even more muscular sound under the hood, but it simply wasn’t needed. Or rather, if you were going to focus on beefing up the musical accompaniment then why didn’t they simply apply those ideas to an entirely new song? That’s the downfall of this whole thing, not the performance but rather the song itself. Jitterbug Parade (or Jitterbug Fashion Parade as it’s been called since, as that’s the title line Milburn uses throughout), is a pale facsimile of a much more original idea with a far more vibrant setting. Chicken Shack Boogie’s appeal wasn’t just that as a record it sounded so good but the message imparted to its listeners forged a deeper connection. It was a song that proudly declared that they too had a social oasis to decamp at, a “place where all the bad cats meet”, a setting where they, not white society, would be made to feel welcome and call their own. As such it was an affirmation of the audience’s cultural importance, a momentary liberation from a lifetime of discrimination, prejudice and daily slights designed to wear down the soul and reduce their own self-image. The characters within were colorful and unapologetic and best of all the non-specific particulars of the lyrics – the fact Milburn was suggesting there was a similar type place in every community to be sought out – gave every single listener hope that they too would partake in the swinging affair. By contrast Jitterbug Parade has to find a way to convey the same type of message in an entirely new scene which automatically is going to seem contrived no matter what setting they choose for it. This time out they’ve set their sights higher up the social ladder, placing the story amidst fine furs and fancy parties. On one hand – and I’m reaching here just to present both sides – this conceivably could be tied into a sense of upward mobility. The idea that the black community as a whole was destined for upper middle class mobility, which in 1949 was hardly a given and thus would be seen as an optimistic assessment of worth. But that’s clearly not the mindset behind it. There ARE no declaratory statements found within, no confident assertions of future positions in society, no celebratory moments of communal success. Instead they’ve merely transposed the action from a dilapidated chicken shack to a night club or private party in somebody’s apartment. The clothes might be better, the drinks might not be illegal hooch that could rot your innards, there probably are no open windows to let the bugs in, but otherwise it’s the same old party in every way. Now that original party was certainly nothing to be ashamed of. The best qualities of the hottest parties rarely have anything to do with where they’re held anyway, but rather the mindset of the people attending. Whether in a chicken shack or even an elegant penthouse it won’t make much difference in your enjoyment provided you, and everybody else, are there for a good time and have left your inhibitions outside. To that end Milburn is attempting to convince you of that intent regarding the mob at this particular party. In that sense he might even be right, after all most parties take on the same vibe after awhile anyway so a few months later the same folks are going to have the same need to cut loose as they had back in the fall. But whether we, the non-participants, want to hear about it in the same depth again is another story altogether. It’s not that the party itself isn’t fun, a party’s a party after all, and we’re reasonably sure those who attend will be talking about it amongst themselves for a few days, but the need to spread the word about these events on the society pages is no longer as pressing. We already know the community as a whole is going to get together and have these bashes to let off steam and enjoy themselves, just as we’re still aware that it remains mostly a closed society – by force as well as by choice – and we can see there’s not much impetus on either side of the cultural divide to get that fact of life changed in the near future. As a result it’s repeating what we already have come to accept, not push for the acceptance of something MORE. Had Milburn taken the same musical structure and been even more forceful in his insistence on breaking down the walls that kept black folks “in their place”, if he had boldly stated that the days of separate but equal (or unequal as it so clearly was in reality) were nearing the end because we weren’t going to stand for it any longer and the celebration he was singing about was a new attitude determined to overwhelm the resistance to that goal, then that might’ve been something worth revisiting. At the very least it would’ve been something that contained a different viewpoint than what he’d already done. A second step along the road to equality. Whereas the first was in embracing the unique cultural environment you’re in, the next would be to force that into broader acceptance rather than allowing it to simply be relegated to the margins. Instead Jitterbug Parade is merely reaffirming the original’s intent in a much less pressing manner. We’ve already been to this party, already spread the word as far as it would go as to how vibrant a scene it was. Another party with the same participants, even in a slightly different setting, wasn’t going to get us any new converts. Musically – even if some of the facets are improved upon – it wasn’t going to get us any bigger sales. It also wasn’t going to make Milburn any more popular, if anything it only hinted that they were all viewing his recent success as a fluke, something to be quickly capitalized on before the buzz of the party wore off and you had to clean up the mess left behind by the revelers. 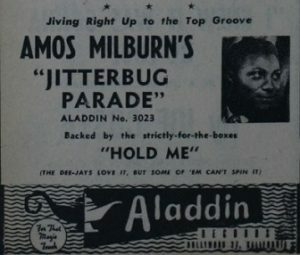 Leave a reply on "Amos Milburn: “Jitterbug Parade”"